Canadian Stage is currently presenting the world premiere of a double-bill of plays by the highly acclaimed young playwright Jordan Tannahill. Unlike Tannahill’s previous plays, both one-act plays take pre-existing stories. Botticelli in the Fire concerns a crisis in the life of painter Sandro Botticelli (1445-1510) and the burning of heretics and sodomites under the puritanical priest Savonarola (1452-98). Sunday in Sodom tells the tale of Lot’s wife and what really happened when God decided to destroy the city. Both plays are deliberately anachronistic. Both concern sodomites, either literal citizen of Sodom or men given to the sexual habits said to pertain there. Both plays concern destruction, whether of people and wealth in Botticelli or of an entire city in Sunday. Both plays are engaging but Botticelli is the one that probes more deeply and has far more to say about the present. Botticelli begins with Salvatore Antonio as the painter clad in a brocade jerkin appearing in the audience with a microphone joking about what it’s like to be back after 500 years. Tannahill’s conceit is that Botticelli is now reduced to playing a one-man show about his own life. While Botticelli does periodically narrate his story more time is taken up with dramatic action that illustrates what happens, so much so that when Botticelli picks up his mic to narrate it jolts us back to the original premise. The historical time is sometime in the 1480s when Botticelli is working on his best known painting The Birth of Venus, a commission from his patron Lorenzo de’ Medici (1449-92) played by Christopher Morris. Tannahill’s main alteration of history is to have Botticelli use Lorenzo’s own wife Clarice (Nicola Correia-Damude), rather than his memory of the noblewoman Simonetta Vespucci, as the model for Venus and to show that, much to her enjoyment, he is having sexual relations with her. Tannahill also decides that Botticelli is having a homosexual relationship with his apprentice Leonardo da Vinci (1452-1519) played by Stephen Jackman-Torkoff. Botticelli’s having a boy on the side means little to either Lorenzo or Clarice, but Botticelli’s affair with Clarice is his principal danger. Savonarola has taken to burning accused homosexuals in public. While it is known in history that Botticelli became a devotee of Savonarola, Tannahill portrays them as enemies and has the preacher force the painter to choose between his love and his art. To free the imprisoned Leonardo, Savonarola wants Botticelli to throw all his paintings in the great Bonfire of the Vanities (“Falò delle vanità") of 1497, where the citizens of Florence were to renounce the material goods that distracted them from holy contemplation. Tannahill’s play thus becomes a portrait of the artist caught up in personal, political and religious turmoil. The deliberate anachronism of the play – using cellphones and texting, having Botticelli and Lorenzo playing squash, having Savonarola appear on a television talk show – are at once a source of humour but also highlight how artistic expression is still affected by politics and religion. Savonarola in particular is made to seem like a modern-day Christian fundamentalist. Blending old and new is James Lavoie’s clever costume design that puts codpieces even on modern gym shorts. The acting is of a high level across the board. Antonio plays Botticelli as a bitchy gay celebrity who finds that his wit alone will not save him or those he loves from destruction. His joking and self-mocking take on a tone of desperation as the danger he is in becomes more pressing. Antonio has a great scene with Nashman in which Botticelli derides the sexual content of his paintings to Savonarola in such a way that he pleases the cleric while simultaneously praising and deriding himself. Christopher Morris’s Lorenzo exudes an air of menace and game-playing. Morris raises the tension by never letting us know when Lorenzo is serious or merely toying with people. Similarly, Nicola Correia-Damude’s Clarice exudes an air of sensuality also combined with game-playing. Correia-Damude is so successful at this it is hard to see how Clarice can also be a supporter of Savonarola. Alon Nashman is an excellent Savonarola, his calm, deliberate speech concealing his ruthlessness. 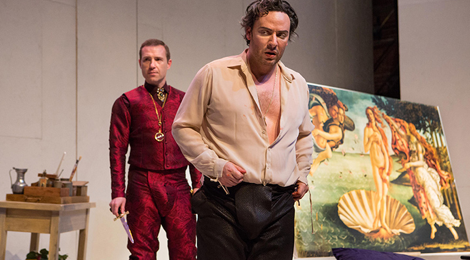 Stephen Jackman-Torkoff gives an urgent performance as Leonardo, whose growing anxiety proves fully justified. 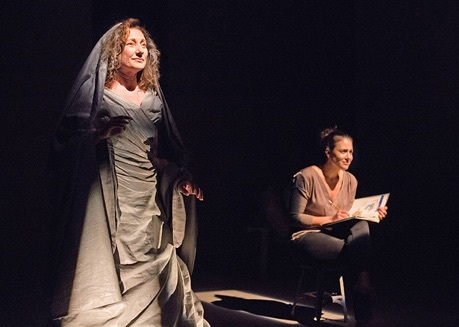 The role of Botticelli’s mother played by Valerie Buhagiar is not necessary to the action, but Buhagiar’s quirky presentation gives us some hint of the origin of Botticelli’s sense of humour. The second play on the double bill, Sunday in Sodom, also takes the form of illustrated narration, but this time the narration dominates the pop-ups of dramatic illustration. The narrator is Lot’s wife herself (Valerie Buhagiar) apparently already solidified into a pillar of salt with only her face able to move. Given the pyramidal cloak designer James Lavoie has given her, she inevitably reminds one of Winnie buried up to her neck in Act 2 of Samuel Beckett’s Happy Days (1961). Yet, Tannahill’s play is not about the will to go on despite all odds. It is rather a superficial, demythologized updating of the Biblical story to the present. In Tannahill’s version the land that includes Sodom and Gomorrah is under military threat. Lot’s wife, whom Tannahill gives the name Edith, tells us how Isaac (Stephen Jackman-Torkoff), fearful after his father Abraham tries to kill him, comes to stay at Lot’s house. Lot (Alon Nashman), who does nothing but watch CNN on television is not happy about this because Isaac is gay. Meanwhile, Edith’s daughter Sahrah (Nicola Correia-Damude), who has two babies, is busy studying for exams at university. The two “angels” are two soldiers from the enemy side (Christopher Morris and Salvatore Antonio), one badly wounded, who seek refuge in Lot’s house. Edith is against it, but Lot and his daughter overrule her. When an angry mob surrounds Lot’s house, one angel shoots wildly, killing Lot’s mother, before the mob takes him and his ailing comrade. The mob kills the wounded angels, but the other angel returns to warn Lot and his family to flee as soon as they can because there will be retaliatory bombing that will rain down on Sodom like hellfire. Lot, Edith and Isaac do flee but Sarah stays behind. The reason Edith looks back is simply to see if Sahrah is following them. While this makes an involving narrative, once it is over we realize that Tannahill has not dealt with most of the reasons why the story of Lot’s wife is famous in the first place. He has removed the supernatural from the story so that Sodom is destroyed by human beings, not God, but that doesn’t explain how Edith was turned into a pillar of salt. Tannahill takes the view that most scholars do that Sodom was destroyed for the sin of inhospitality rather than vice. Yet, in Botticelli the painter and Leonardo are called “sodomites” and Savonarola says that Florence’s sins are as great at Sodom’s, therefore we might reasonably expect an out gay playwright like Tannahill at least to allude in his play about Sodom to how or why the city became synonymous with particular sexual acts. Tannahill has Edith say that “they” do tell us that the destruction happened on a Sunday. He could easily have her say what else “they” say about Sodom and its Sodomites. The play ends in a gesture that makes nonsense of what preceded it. Edith, who has been solidified in place for the entire show, suddenly turns around and then looks back at the audience. We assume that either Tannahill or director Estelle Shook was having Edith narrate the events after she had been salified. The turning back makes it appear that her salification has not yet happened. If that’s true, why has either Tannahill or Shook imposed such immobility on Buhagiar who is playing Edith? The prime reason to stay to see Sunday is the fantastic performance Buhagiar gives as Edith. Her care for Sarah and Isaac and her annoyance with Lot and the angels make her seem like a very real person. Buhagiar makes Edith’s description of the fear reigning in her household truly gripping. The other five roles are so tiny that the actors have little chance to make an impression, though Nashman’s Lot, stuck in front of the television news will remind us of too many older people who have substituted watching television for active participation in life. Most noteworthy about the design of Sunday is Steve Lucas’s use of squares of light to pick out people as Edith mentions them. Compared to Howard Barker’s revisionist telling of Genesis 19:1-29 in Lot and His God (2012), seen just last year, all Tannahill does is to place the biblical story in a contemporary setting without examining its importance or negative influence. This is odd considering how much contemporary relevance he extracts from the story of Botticelli. Tannahill’s use of anachronism is also more daring in Botticelli than in Sunday. In fact, Tannahill pushes it almost to the point of cartoonishness without diminishing the seriousness of the dilemmas that Botticelli faces. This is quite a feat to pull off, but under director Matjash Mrozewski gets the tone of satirical tragedy just right. It is exciting to see Tannahill strike out from his previous subject matter of suburban gothic into reinterpretations of pre-existing stories. The double bill will make an audience eager to follow him whatever direction he takes next. Photos: (from top) Christopher Morris as Lorenzo and Salvatore Antonio as Botticelli; Alon Nashman as Savonarola; Valerie Buhagiar as Edith and Nicola Correia-Damude as Sahrah. ©2016 Cylla von Tiedemann.